A UNESCO World Heritage site, a sleeping giant, a majestic mountain towering right behind the fascinating “black city” of Catania, a florid and verdant soil where delicious typical products are harvested: welcome to the marvellous Mount Etna, the tallest active volcano in Europe, one of the most extraordinary and famous landmarks of Sicily. The surface of “Mungibeddu”, as the Sicilians love to call it, is characterized by an invaluable wide variety of landscapes and sceneries alternating urban areas – tiny villages of the Park of Etna, all pretty and picturesque, wonderful hamlets perched on its slopes such as Castiglione Di Sicilia, as well as great cities like Catania – with woods and lava stone areas, often covered in snow during Winter. Its frequent eruptions always leave the world speechless, and if you will be lucky enough to be around for next one you’ll see that such a show is very hard to forget. If you want to witness it directly book a stay at our villas in Catania or our villas with pool in Taormina. 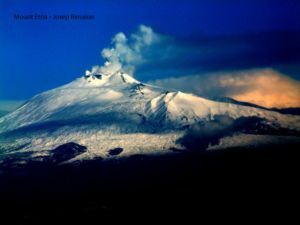 A surprisingly vast range of activities is available for tourists in the Park of Etna – needless to say, it’s hard to pick one. From the most traditional excursion to the top craters of the volcano to skiing on Mount Etna and living the unforgettable experience of sliding on the snow while staring at the breath-taking panorama of the countryside and the Ionian sea (skiing and watching the sea! ), there is really plenty to do. A great way to discover its genuine atmosphere, the secrets of its history and the traditions of the community living on its slopes, is to take the Circumetnea Railway from Catania: a train will take you to all the most important towns of the Etna Park, such as Bronte, the world capital of pistachios, where you can’t miss a taste of some of the hundreds of variations of pistachio-based recipes, or Nicolosi, where a cableway will take you to the tallest craters of the volcano, as well as Linguaglossa – one of the most famous destinations for Winter sports lovers, with its beautiful ski runs. The lovely hamlet of Castiglione di Sicilia is also noteworthy: its position graces the village with a breath-taking view over the countryside. The picturesque panoramic railway ends its tour in Riposto, a tiny seafaring village also called “the port of Etna”: we recommend a binge of local seafood delight in one of its typical little restaurants, followed by a relaxing stroll along its pretty, panoramic seaside promenade. The verdant landscape of the Etna Park is perfect for hiking lovers, as well as for visitors looking for contact with nature: an impressive variety of flora and fauna is carefully preserved within the area. The whole area is very fertile, and products coming from Mount Etna are famous worldwide: from the delicious wines to mushrooms, almonds, pistachios, oranges and much more. Food and wine tours are a true delight: farmhouses and refined “agriturismo” often organize wine tasting sessions, and restaurants serve tasteful local delicacies everywhere.